*drawing utensils, such as pencils, pens, charcoal. *Supplies marked with an asterisk are available for purchase in the Shakerag store. Emily Leonard has been a full-time studio artist for over thirteen years. Her paintings are included in numerous private and public collections around the world, including those of the Tennessee State Museum, Swedish Hospital in Seattle, UBS, and FirstBank. Leonard’s work has been published in dozens of magazines and catalogues including Studio Visit by Open Studios Press and Garden and Gun magazine. The painting I woke up and loved you is featured in the book Speak for the Trees, alongside such artists as David Hockney, Christo, and Mark Ryden. 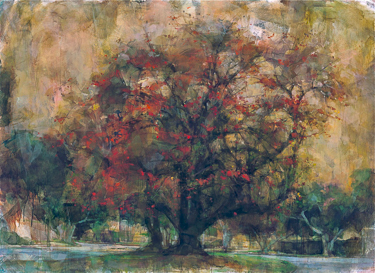 Emily is represented by Davidson Galleries (Seattle WA), The Rymer Gallery (Nashville TN), Blue Spiral 1 (Asheville NC) and Anne Reed Gallery (Sun Valley ID). It occurs to me from time to time that one of the best reasons to live is to experience the look of the sun coming through a window. I was born in Tennessee thirty-four years ago. Despite having lived in various parts of the country, I have made an occupation of painting the middle Tennessee landscape for twelve years now. Last winter I spent six weeks in New York City. Of the many remarkable works of art I saw while there, the one that hit me the most squarely in the gut was a statue called “Mississippian Figure” from the 13th century. I had ducked into the Met that afternoon for the sole purpose of warming up. I quickly made my way to the Arts of Oceania room because that is where the giant sloping windows are and I wanted to stand next to one and let the sun warm my face. From that spot I saw the Mississippian Figure clear across two rooms and immediately felt a lump in my chest. I walked to it and stood in front of it for several minutes before reading the plaque next to it that told me it was found on the banks of the Duck River in Humphreys County, TN in 1895. The weight in my chest then fell clear through to my feet. Being next to this piece felt like a deliverance. It seemed to be an answer to the yet wordless, unformed questions I had been asking myself in the studio for a decade. For a long time I painted and didn’t ask why. When I started to ask why, and I began to doubt, so now I like to keep my head in the beginning of things. I like to ask the questions and follow the way of curiosity and intuition through working. Perhaps in the working I will find an answer, but I would rather the viewer find the answer while I am already onto my next piece. The questions go something like this: If I can look closely enough, is there something I can find in between myself and my subject that wasn’t already known? Is there something abiding in the space where the looking occurs? Another way to say it is this: What does the surface say about the story? It is difficult for me to separate my life from my life as an artist, and my life as an artist from my finished pieces. It seems all of this speaks about the effort to distill the passage of time into one moment or object. This Mississippian figure haunted me because it so clearly and easily did just that. It carried with it the stories of the land I paint, not simply the ones from long ago, but also the ones that are happening in that museum right now and the ones in the earth that I walk and touch daily. Our stories and the story of the land join, at once being lived and being told with the spaces between seamlessly shifting, expanding. My process and practice mimic these movements: I break down an image and build it back slowly with hundreds of washy layers, glazes and gestures that are more searching than literal. My pieces both take time and contain time. I want them to come upon the viewer as such – slowly and intimately, as if the viewer feels like he found this image instead of me. I want to get at the experience of being in your body in a place. Rather than painting the tree out the kitchen window, I want to paint what it feels like to stand at the kitchen window, looking at the tree while your kettle boils. The moments of mindlessly casting a gaze upon something are to me filled with the real plain life, the simple breath of it all. This statue told me that the answers are in the excavation. I suppose I paint to excavate the truth from the literal, the space from the air, the being with from the being next to, and the seeing from the looking.